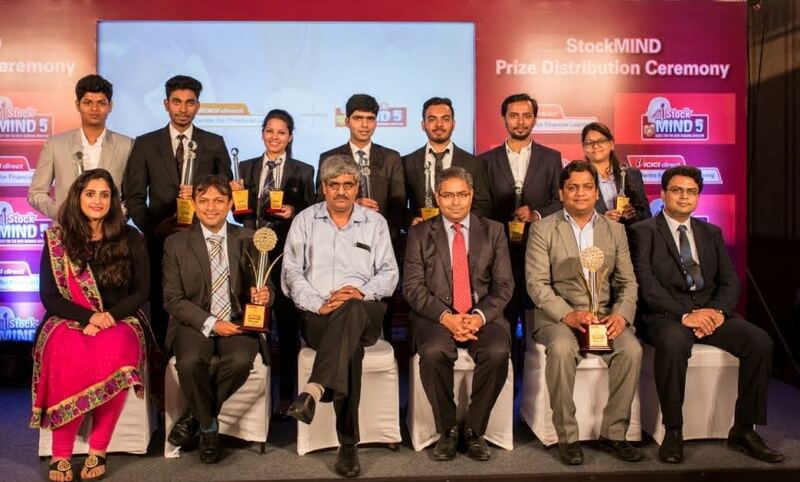 Mumbai: ICICIdirect Centre for Financial Learning (ICFL) announced the winners of StockMIND Season 5. Launched in 2012, StockMind is a unique gamification concept that allows participants to invest in real-time stock market using virtual money on a specially developed platform. StockMind is India’s largest inter-collegiate competition on stock investing with the aim of educating the youth on investing in the stock market in a unique and exciting manner. The winners were felicitated at a gala event held in Mumbai. Mr. Vineet Arora, EVP & Head of Product & Distribution and Mr. Neeraj Joshi Head-ICICIdirect Centre for Financial Learning were present at the felicitation. StockMIND Season 5 set a new benchmark by reaching out to over 2.4 lakh students from 579 colleges in over 80 cities. StockMIND’s popularity among students and colleges is reflected in its growing participation each year since its launch in 2012. In 2016 StockMind was recognised as the ‘Largest Competition on Stock Investments’ by the Limca Book of Records. Every year, the programme begins with an informative seminar in every participating college where students receive an overview of the stock markets and elementary knowledge of investing in stocks. This is followed by StockMIND, a seven-day event, wherein the participants have to invest with virtual money in a specially designed platform with live stock prices. Over a period of seven days, the students are ranked as per the value of their portfolio. StockMind is played using virtual money and does not involve any financial risk for participants. This year the winners from 579 colleges qualified for the Grand Finale which was held March 15-23, 2017. StockMIND Season 5 was held separately for Post Graduate and Graduate students with a special focus on participation from women. Winners judged basis the highest portfolio appreciation from both the College and National Level won exciting prizes. StockMIND 5 Winners: Vijay Shukla from the IIM, Sirmaur was the winner of the StockMIND 5 and bagged the winning cash prize of Rs One Lakh and an all-expense paid trip for two to Thailand. Arman Kumar from TKWs Institute of Banking and Finance, New Delhi was the winner of StockMIND 5 Grads and received a cash prize of Rs Fifty Thousand along with an all-expense trip for two to an Indian destination. StockMIND 5 Runner-up: Sahil Sethi from Maharaja Agrasen Institute of Management Studies, New Delhi and Parth Vora from National Institute of Banking Management, Pune were adjudged the 1st runner-up and 2nd runner-up of StockMIND 5. The 1st runner-up and 2nd runner-up of StockMIND 5 Grads were Nipun Sancheti from KC College, Mumbai and Komal Sharma from Apeejay College of Fine Arts, Jalandhar. StockMIND 5 Winners in the Women’s Category: Priyanka Mishra from SSR Institute of Management and Research, Silvassa bagged the winning title of StockMIND 5 Women’s category. She won a cash prize of Rs Ten thousand. Komal Sharma was the winner of StockMIND 5 Grad Women’s category. She is also the 2nd runner-up of StockMIND 5 Grad.